After much anticipation we landed in Paris, spent after a very long night, with just our adrenaline to keep us moving. 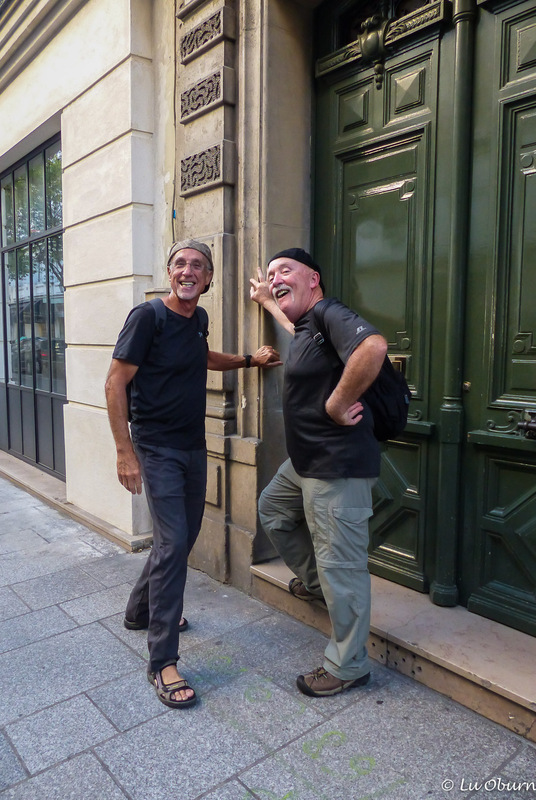 We hopped on the Easy Bus at Charles de Gaulle airport and, after Elan (our driver) traversed the side streets to avoid rush-hour traffic, we arrived at the apartment we had rented. In five days we know we will barely scratch the surface here in the City of Lights, the most dense city in all of Europe, (with 20x’s more density than New York City) but we are planning to give it our best shot. Since we will be on the go so much I have decided to write “mini-posts” while in Europe, then go back and add more detail when we return to the states. Our first two days in Paris began with a leisurely breakfast at a local boulangerie, where I was able to practice a little of the French language – emphasis on little. Once fortified we walked along the Seine River to tour Sainte-Chapelle, a royal Gothic-styled chapel, built around 1238, once the residence of the Kings of France. It houses some of the most extensive stained glass of the 13th century anywhere in the world. From there it was a short walk to Notre Dame (Our Lady of Paris), a medieval Catholic Cathedral. It is among the largest and well-known churches in the world. We had hoped to climb to the top of the tower but the lines were too long and we had much yet to see. 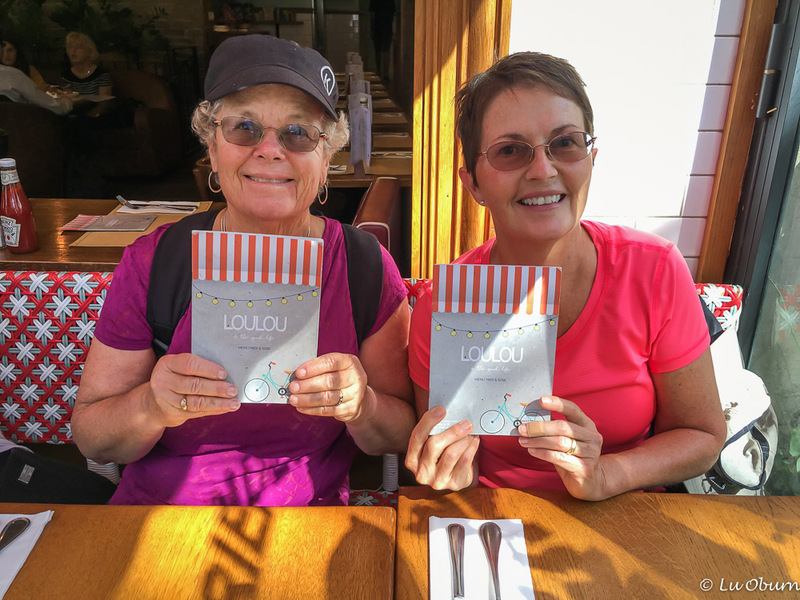 Lunch was in the Latin Quarter at LouLou’s, a must-top for this Lulu…délicieux. Since we were enjoying the local fare so much, we agreed that walking was needed to burn off the calories so off we strolled to the Louvre Museum. Crossing over the Pont Neuf, the oldest standing bridge across the Seine, we stopped to take a few photos of some Locks of Love before continuing on our journey. Although we had purchased a 4-day Museum Pass, which allowed us to skip some of the longest lines, once inside the Louvre it is impossible to avoid the crowds. You’ve got to just shoulder your way through the massive surge. We all agreed that for that reason alone, some of the smaller museums were more to our liking, but the architecture, the paintings, and sculptures were magnifique! We rounded out our first day with an evening reservation at the Eiffel Tower where the views from above are breathtaking. Day two took us to the Orsay Museum, which we all agreed was incredible. Build around 1900 and housed in an old railway station, the architecture and the clock towers are impressive. It holds the largest collection of impressionist and post-impressionist masterpieces in the world, including artists such as Monet, Degas, Van Gogh, Renoir, and Cézanne. A walk to the Trocadéro for another view of the Eiffel Tower and a stroll through the Rue Cler market and day two was a success. Fantastic, finally somewhere where I have been too, yay it looks familiar. Wonderful city Paris, Enjoy! Oh this brings back such wonderful memories of my favourite city in the world. I was lucky enough to spend 3 weeks there a few years ago. We too missed out on climbing the Notre Dame tower because of the huge line up, and were awed by the beauty of Sainte Chappelle. Three weeks would be so wonderful Alison. It is such a wonderful city. I am awestruck at every turn. Looks like you are having a marvelous time. The Eiffel Tower is beautiful. LuAnn, the city of lights and romance the views from eiffel tower must have been surreal ❤ yor capturing such beautiful pics. Looking forward to reading and seeing more. Thanks Marta. You would love Paris. I still can’t believe I am here! Wow, that was already a very busy schedule the first days there! My husband were there hmmm, about 25 years ago, we weren’t married yet, it was our first trip together…I remember us buying a bottle of wine to enjoy a glass in our room and not having a bottle opener😂we never returned, that’s a pity, another trip to plan! I’m sure we will leave happy but exhausted. There is so much to see in this world that I’m not sure we will be back either. Finally, a post of your first two fun-filled days in Paris! Loving it and almost as good as being there, LuAnn. That farmer’s market should have provided some excellent picnic food on the go. What memories you can talk about for years to come! It has been an amazing experience already Shirley. I haven’t had a good night’s rest yet but I am pushing on! As usual, you know just the right places to see. Such beautiful places. I am surprised you were allowed to take photos of the famous art work. Also surprised the lock of love were still there as I had heard that they were being removed because of the weight (?) Always an adventure to go along on your trips with you. Thanks for making it all come alive. Thanks Gale. We were surprised as well at the ability to take photos. We just couldn’t use a flash. As for the locks of love, I thought they had been removed as well. LuAnn so glad to hear you are having a wonderful time. Hard to avoid the crowds in such popular locations for sure. Your photos are gorgeous and the Eiffel at night my top pick. Enjoy! Thanks Sue! The crowds are what we expected in such a crowded, touristy city. We do as well Pete. Love your posts and your photography is so wonderful. The excellent combination of the both the written language and the imagery really helps us travel along with you. Thanks so much Ardythe! It is tough to take photos in such a crowded city. I’m very happy for you, Lu. We finally get to see something out of the US from your blog, and you didn’t disappoint. Very nice pics. That’s how I was when I go to the Colosseum in Rome. It’s so hard to get in there because of the line that goes on up to the outside of the building. Thanks my friend. It is tough to take photos when there are crowds everywhere. Paris is definitely one of my very favorite cities in the eorld, so thanks for taking me back, for a few moments this morning. It is my husbands “home town” so we have been many times over the years….there really is no place like Paris!! Enjoy the food and the lovely parks…. Such a great city to stroll and stroll and eat and eat. Looks like you’re having a wonderful time so far. Beautiful photos! I think Jim would have let me go in the Louvre by myself, with crowds like that. We are having a fabulous time. The crowds at the Louvre were incredible. So much better at the Orsay and the Orangerie Museums. Lovely LuAnn! Paris is a magical city and my favorite in the world. I studied abroad in Paris for a semester my junior year of college and it has always been very special to me. I hope you make it to musee Rodin my favorite as well as spend lots of time in the gorgeous parks. What an amazing city it is! It is a fascinating city! I love how you have thrown yourself into your travels and are soaking up so much so quickly, it’s exciting to see. I am hoping to get some holidays booked off soon so will see if I can link up with you along your way at some point.